I am coming up on 6 months since I was diagnosed with Celiac and started eating gluten-free. And in that time I have found that some of my whole wheat favorites have easy and delicious gluten-free versions, and others don't. For example, bread. Gluten-free bread is a tough sell for me since I still remember well the deliciousness of my honey whole wheat bread and the airy crumb and crunchy crust of an artisan loaf. But pancakes! My gluten-free pancakes are just delicious! If I do say so myself. One thing I've quickly realized is that most recipes for gluten-free goods are decidedly not whole grain. But after spending years tweaking recipes to achieve deliciously healthy whole grain baked goods with wheat, I'm not willing to settle for the fiber-less not-hearty un-filling recipes full of starches and white rice flour that so often populate my search results. After much searching and experimenting, I present to you this delicious recipe for whole grain gluten-free pancakes. If you hate weight measurements, I'm really sorry (and I did include a volume approximation just for you! ), but I have already been thoroughly converted to baking by weight with gluten-free flours. I dug a decade-old IKEA digital scale out of my cabinet and have never looked back. I find it much easier to pour rather than scoop out when dealing with all these types of flour. Baking by weight makes doubling or tripling a recipe easy-peasy too. Often gluten-free recipes will say, "use 1 cup or so many grams of gluten-free flours," and then provide a list of about 300 different gluten-free flours you might use. As a gluten-free newbie, I did not find this useful. I want a combination of flours that will work and taste delicious right now! So this recipe prescribes specific flours in specific amounts, but of course you can and should substitute your favorite gluten-free flours (although the mysterious properties of buckwheat may be why this recipe needs no oil) or fudge the amounts and flours based on what you've got on hand, as I often do. But here is my favorite version so far. The one I keep coming back to. *Certified gluten-free products are important for Celiacs and those with an especially sensitive gluten intolerance or allergy. If you are choosing to eat gluten-free for other reasons, I wouldn't bother. **I feel obligated to tell you that the dairy-free version does not brown up as nicely, although it helps if you fry it up in plenty of coconut oil or ghee. Measure buttermilk in a large measuring cup, add the other wet ingredients, and beat together. Pour the wet ingredients into the dry and mix well. No need to worry about over-mixing and over-developing the gluten, because there is none! I like my batter pretty thick because it creates puffier pancakes, but feel free to add more liquid so it's the consistency of your favorite pancake batter. Now, let the batter sit (so the flours can absorb the liquids) while your cast iron warms up (about 15 minutes). Pour 1/4-cup of batter (I use a ladel) onto a hot cast iron griddle greased with butter, ghee, coconut oil. Flip when golden brown on the bottom and little bubbles form on top. Enjoy hot with maple syrup! Look at how they puff up! After months of making single-batches of different recipes of pancakes (strange after regularly making the quadruple version of my whole wheat and oat pancakes! ), I confidently make the double version of this recipe knowing that my kids and husband will eat them too, and that I will enjoy a quick breakfast with any leftovers. These smell as delicious as they look. 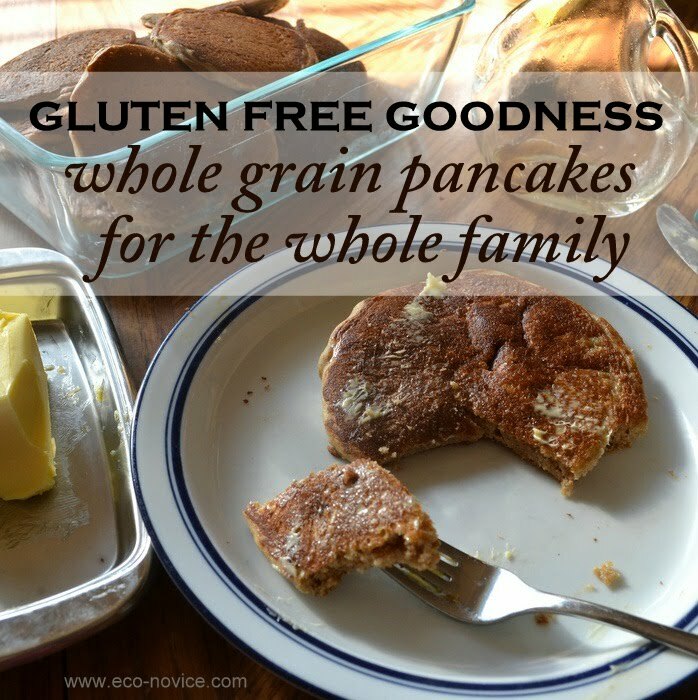 What is your favorite whole grain gluten-free recipe? I love that you shared the various amounts depending on the flour. I had no idea that there were so many gluten-free options! These sounds so good. I am so glad you found a pancake you can all enjoy! Wonderful!! I hope you continue to make other gluten-free discoveries the whole family can enjoy. A Celiac diagnosis is no small thing, so good luck. These pancakes look very good!